As Winter closes its icy grasp on much of Europe and the weather map turns blue, I trudge up to the High Street, puffy jacket zipped up above my chin, gloves and boots keeping extremities warm. I am heading for the Saturday Farmer’s Market. The fish stall (fresh oysters! ), the deli stalls (aged Gouda and Comte), Olivier’s Bakery stall – these will claim my attention. 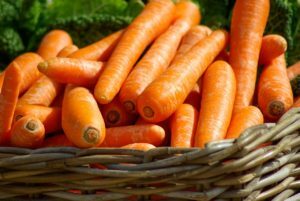 But also fresh vegetables straight from the farm, organic seasonal produce, carrots, parsnips, potatoes, cabbages, kale and, to a lesser extent, peppers and aubergines. They are, as always, expensive. The people who work on the stalls can’t tell me if vegetables, per se, are more expensive right now, they only know their own farms, but a chat with a buyer from a local supermarket reveals that the price of green vegetables in the wholesalers is rising and just about the only places in Europe which are still growing large quantities of greenery (usually under glass) at this time of year are southern Italy, Greece and southern Spain. The last of these, in Murcia and Almeria on the Med and Malaga and Cadiz provinces in Andalucia, are the major suppliers of the greenery on our supermarket shelves, courgettes and aubergines, broccoli and peppers. Yet, this year, snow and ice have reached these southern climes. The region does include some fairly formidable mountain ranges These include the Sierra Nevada above Granada and the Sierra de las Nieves (the clue is in the names), as well as Sierra Espuna in Murcia. 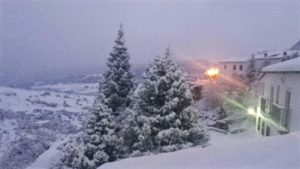 The Sierra Nevada is snow-topped and is home to ski resorts for most of the year and the Sierra de las Nieves supports snow throughout the Winter and Spring. It is rarer in other ranges and the Sierra de Grazalema is downright baking in Summer – too hot to visit if you plan to do much exercise. Nonetheless there is snow in Winter. The Sierra de Grazalema, the mountains to the east of Jerez, are well-known to regular readers of this blog. It is the setting for some of ‘Reconquista‘ and even more of its sequel. 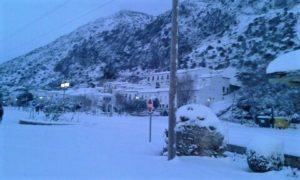 In ‘Reconquista‘ the mountains were blizzard-wracked as my characters crossed the snow-bound passes to try to get to Granada, having been forced from their homes in Jerez by the Christian occupation of that city. 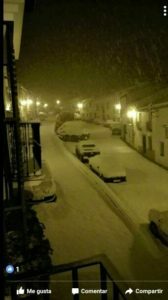 Such snow is unusual in modern times, although the climate may have been different in the 13th century (it certainly was in England). 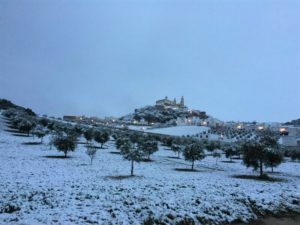 This Winter, however, the Sierra de Grazalema is indeed blizzard-wracked, and travelling is difficult, even for folk in four-wheel-drives. Friends have sent me the, rather stunning, photographs which accompany this article. If it weren’t for the architecture (and the olive trees) I would say these vistas were Alpine. How long these scenes will persist no-one knows. 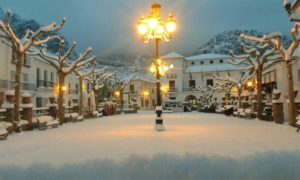 The towns of Grazalema, which nestles between the peaks of San Cristobal and El Endrinal, and Zahara on its mini-peak, look almost like pictures from a Christmas card. However pretty, the snow in the mountains and the frosts on the plains where the farms are located are causing vegetable prices to rocket. The price of a kilo of Spanish courgettes has risen threefold since the holiday. When it finally melts all that snow will flood the cave systems, which riddle this karstic landscape and, strange to say, this is just what the characters in the sequel are experiencing right now! (I’m writing these chapters at the moment.) More on caves in another blog. This entry was posted in Nature Watch by juliej. Bookmark the permalink.